To develop an automated picking and packing cell customised to suit specific requirements. Use 3 FANUC 6 axis robots fitted with customised grippers and working in a closed cell to take boxes of jam from an assembly line and stack them onto pallets with incredible speed and precision. A fast and reliable system that operates around the clock, saving time and increasing productivity. Fine Swiss jams and preserves on fresh bakery items for a good start into the day. Whether it be at the breakfast table at home or at a sophisticated hotel buffet in the morning – the food manufacturer Hero AG in the Swiss town of Lenzburg provides its customers with fresh fruit preserves daily. Several feats of logistics are required before the jam is on the customer's table, ready to be consumed, in an aluminium tin or a small jar. The automation specialist Robotec, based in the Swiss town of Seon, plays a key role in this supply chain. Because after filling, the units of jam first have to be packaged according to type in inboxes, and these have to be stacked for further transport on pallets. 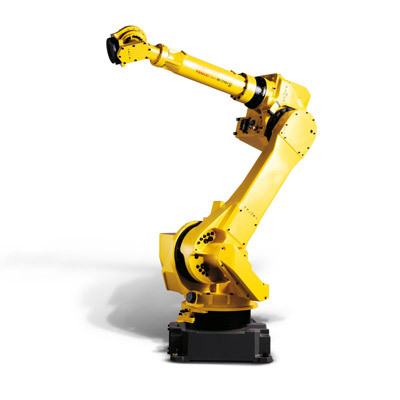 For the last step of this logistical process, FANUC robots with specially adapted gripping technology from Robotec come into play. A palletizing cell installed at Hero, and a six-axis robot with special gripping technology, enables palletising around-the-clock – the system is fast, reliable, accident- and failure-proof. Whereas five employees use to have to tediously load packed boxes of jam, today there are three FANUC M-710iC robots on the job in a closed cell. At an incredible speed, the grippers pick up two boxes at once from the feeding assembly line, turn towards the pallet and set down the boxes with millimetre precision on the pallet according to the programmed stacking scheme. Ten boxes per layer, for a maximum of 15 layers. As soon as the pallets are loaded according to specification, the robot sends a signal to the operator. The operator opens the cell, removes the loaded pallets and,using a pallet truck, manually places an empty euro palette in the pallet position. Using the hand operation device located outside the cell, the product specific stacking scheme is selected. After leaving the work area, the access doors of the cells are closed, acknowledged on the hand operation device by the system operator, and the system is started. Based on the information concerning the product and the stack size, the boxes are gripped by the robot and stacked on the pallet according to the selected stacking scheme. What looks like such an easy and smooth process, took quite a lot of development work. Although the palletising cell was set up and tested by Robotec at the customer's plant, there were in fact some unforeseen challenges and new requirements. For example, the palletising pattern had to be adapted due to the conditions of the pallets, and the hand operation device had to be redesigned. Because the design was to forgo a visual inspection through camera technology on the grippers, the stainless steel grippers had to be designed in such a way that they worked reliably through a clever movement technique and that no conversion of the gripper equipment would be necessary for production changes. "For this, we chose a shovel shape with an integrated slide, which pushes slightly against the boxes when setting them down on the pallet, whilst the gripper shovel retracts", explains Daniel Bärtschi, the Robotec responsible for this project. In addition, two basic concepts had to be taken into account – one for heavy glass and one for aluminium units. "The different box weight must be calculated into the movements of the robot, so that the boxes will not fall down due to the centrifugal force of the fast pivoting movement from the conveyor towards the pallet", the development engineer further explained. The working speed was one of the most important programming tasks which had to be readjusted on-site. What's more, the various box sizes had to be taken into account, depending upon whether the product was filled into jars or aluminium containers. One challenge also involve the behaviour of the foil-wrapped boxes on the gripper shovel. "The jam in the packaging units contained in the boxes is still warm when it arrives at the palletising cell. The temperature is transferred onto the foil and, as result, the box becomes slippery during the gripping and transport process." This may result in the boxes not being placed properly on the shovel, which means the palletising pattern is no longer correct, and the pallet has to be repacked due to boxes that have been stacked crooked on the pallet. The specialists from Robotec mastered these challenges to the satisfaction of Rudolf Roth, Head of Production at Hero, who supervised the installation and commissioning: "Installation proceeded according to tight time parameters, and the technicians from Robotec completed the commissioning of the palletizing cell to our satisfaction." Thanks to the excellent preliminary work and the tests of the complete cell at the Robotec plant in Seon, Bärtschi and his colleagues were able to respond to the unforeseen events in a targeted manner. "An installation that was not planned in the requirements specification was the simplification of the control panel. Originally, there were still buttons integrated into the control panel, and the operator was able to navigate through a menu via the touchscreen", says Bärtschi. Roth adds: "Our international operators of the palletizing cell found this to be too complicated, so that Robotec was required on very short notice to develop a modified control panel that was restricted to the key steps "Pallet change" and without any additional buttons. This worked beautifully, and our employees no longer have any problems with it." The operator does not select any program on the robot. Via the control panel, he can select the desired number of layers, as well as the type of pallet – euro pallet or smaller. He acknowledges and starts the program. In addition, the intuitive control scheme was chosen, using the internationally understood colour codes. Red means "Stop", green stands for "Start". "What often looks very easy and works accordingly, is often the greatest challenge", says Bärtschi. But for the Robotec team, this is their daily bread, because they are solution providers, and their job is to implement customer needs. In addition: The pallets packed by Robotec according to type at Hero are taken to an additional service provider, unpacked there and recombined. Also for these pick-and-place tasks, Robotec has successfully developed and installed several systems. The further development of the gripper attachments is one of the decisive key factors for advancements in robot technology. Constantly increasing requirements in terms of flexibility and precision, lighter materials, as well as new, demanding areas of application, are constantly presenting development engineers with new challenges. That is why Robotec precisely analyses in each order which gripper technology is necessary for the requested application. In general, over the past twenty years, there have been hundreds, if not thousands, of various solutions developed for all conceivable areas of industry. This is driven by the constantly increasing pressure of competition that requires industrial companies to find cost-saving alternatives for their production processes. Automation solutions, using state-of-the-art robot and gripper technology, are finding ever-increasing use along the value-added chain. As a general rule, the size and shape of a robot gripper is determined by what exactly is to be picked up. There are grippers that stack, grab, pick up by section, grip in a force-fitting manner and use one or several gripping points. Some work purely mechanically, others use vacuum technology. At a time when the consumer products industry is increasingly developing products in all conceivable shapes, materials and sizes and sizes, the grippers are becoming more and more complex and ever more advanced. "The product cycles are becoming shorter and shorter", explains Bärtschi. "That is why we are receiving an increased number of enquiries for fully-automatic manufacturing cells." All companies want to increase their productivity and simultaneously reduce costs. It's all about doing more with less. That is what the specialists from Seon managed to do for their customers. Since 1983, Robotec has been developing and building automation systems of all kinds. The applications range from basic pick & place solutions right down to the handling of heavy parts. Because depending upon the task required, different sizes of six-axis grippers can be deployed as robot elements. Today, the company focuses on robot-assisted automation – from the concept phase, right down to commissioning. For four years now, it has been possible to perform final production inspections of complete systems at the Robotec plant before the machines are put into operation at the customer's facility. More and more, flexible robot solutions are boosting productivity in the manufactured foods sector. Faster product changes and shorter product cycles are the result. In addition to palletising, picking and packing are among the most important tasks for robots equipped with grippers adapted to the task. In this, the range of Robotec robot solutions in the food processing industry runs the gamut through closed palletising cells, right down to sorting and pattern placement of products, such as the packaging units of the jam manufacturer Hero.